Demolition Man is currently celebrating its 25th anniversary and Taco Bell is bringing the celebration to San Diego Comic-Con this year. The 1993 sci-fi movie starred Sylvester Stallone as John Spartan, a policeman that is reanimated in the year 2032 to take down Wesley Snipes' villainous Simon Phoenix character. One particular scene that stood out from the violent sci-fi film was a vision of the future in which Taco Bell (or Pizza Hut in foreign territories) is considered fine dining. Demolition Man's thoughts on fine dining in the future were and are still very questionable, but Taco Bell is throwing caution into the wind and recreating the restaurant for San Diego Comic-Con. The convention takes place July 18th through the 22nd this year, and the futuristic Taco Bell pop-up event will be open from 6:00 PM to midnight, throughout the 4 days, at 658 Fifth Ave. in San Diego. As an extra bonus, the food is free and a Comic-Con badge is not required. There will also be exclusive Taco Bell and Demolition Man merchandise available to purchase and it will see the return of Taco Bell's Nacho Fries. It isn't clear if the Demolition Man Taco Bell event will feature valet parking like in the movie, but it still sounds like an interesting idea. In the 1993 movie, Taco Bell had beat out all other restaurants in the "Franchise Wars." All restaurants in the film are Taco Bells and as previously mentioned, they are considered to be the highest form of dining, which also included a dance floor as well. Nacho Fries and dancing is all anyone really needs in the future, apparently. 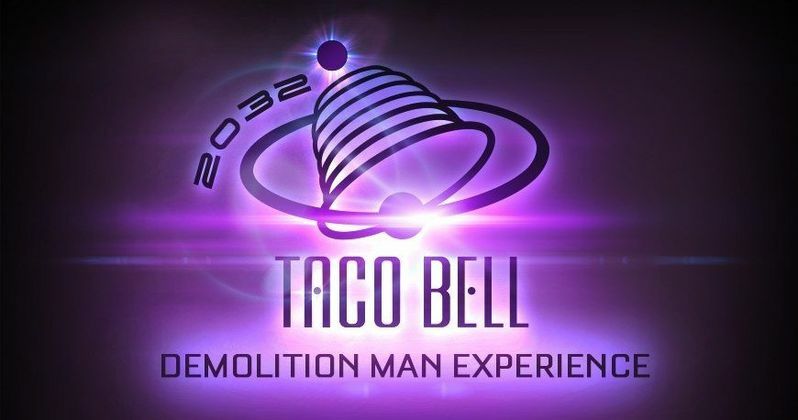 Taco Bell released a statement about the Demolition Man and San Diego Comic-Con joint venture. The main vehicle is to promote the return of the Nacho Fries, but it looks like the fast food franchise is embracing the movie's idea of the future. Free food at Comic-Con is pretty common, and there's a good chance that this pop-up event will be pretty popular. Marisa Thalberg, Chief Brand Officer of Taco Bell Corp had this to say. "When you create a fake trailer for a fake movie for a real product that surpasses all expectations of products (and movie trailers), it seems inevitable that you have to create a sequel. And what better way to tease this sequel, than pay homage to a real movie's 25th anniversary-one that had a very compelling view of a fictional future?" In the 25 years since the release of Demolition Man, Taco Bell has come pretty far, though there is no valet parking and disco yet. The fast food franchise has tried to clean up its act over the years, going out of its way to reduce sodium in its menu every year and has started to bring in healthier options. In some markets, Taco Bell has introduced the Cantina, which seems to be one step closer to the real-life "Franchise Wars." In addition to the healthier and fresh menu items, guests can also purchase alcohol, just like Demolition Man. You can read more about the pop-up event from SDCC Blog.